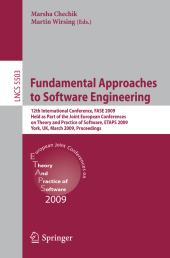 This book constitutes the refereed proceedings of the 12th International Conference on Fundamental Approaches to Software Engineering, FASE 2009, held in York, UK, in March 2009, as part of ETAPS 2009, the European Joint Conferences on Theory and Practice of Software. The 30 revised full papers presented together with 2 tool demonstrations were carefully reviewed and selected from 123 regluar and 9 tool paper submissions. The topics addressed are model-driven development, synthesis and adaptation, modeling, testing and debugging, model analysis, patterns, security, queries and error handling, and tools (demos) and program analysis. Scalable Analysis of Scalable Systems.- Scalable Analysis of Scalable Systems.- Model-Driven Development.- Rewriting Logic Semantics and Verification of Model Transformations.- Confluence in Domain-Independent Product Line Transformations.- Object Flow Definition for Refined Activity Diagrams.- A Category-Theoretical Approach to the Formalisation of Version Control in MDE.- Synthesis and Adaptation.- Controller Synthesis from LSC Requirements.- Interface Generation and Compositional Verification in JavaPathfinder.- A Formal Way from Text to Code Templates.- Context-Aware Adaptive Services: The PLASTIC Approach.- Modeling.- Synchronous Modeling and Validation of Priority Inheritance Schedulers.- Describing and Analyzing Behaviours over Tabular Specifications Using (Dyn)Alloy.- Testing and Debugging.- Reducing the Costs of Bounded-Exhaustive Testing.- Logical Testing.- Cross-Entropy-Based Replay of Concurrent Programs.- Model Analysis.- Control Dependence for Extended Finite State Machines.- Proving Consistency of Pure Methods and Model Fields.- On the Implementation of @pre.- Formal Specification and Analysis of Timing Properties in Software Systems.- Patterns.- Formal Foundation for Pattern-Based Modelling.- Problem-Oriented Documentation of Design Patterns.- Security.- Certification of Smart-Card Applications in Common Criteria.- Transformation of Type Graphs with Inheritance for Ensuring Security in E-Government Networks.- A Formal Connection between Security Automata and JML Annotations.- Queries and Error Handling.- Algorithms for Automatically Computing the Causal Paths of Failures.- Mining API Error-Handling Specifications from Source Code.- SNIFF: A Search Engine for Java Using Free-Form Queries.- Inquiry and Introspection for Non-deterministic Queries in Mobile Networks.- Tools (Demos) and Program Analysis.- hol-TestGen.- CADS : Computer-Aided Development of Self- Systems.- HAVE: Detecting Atomicity Violations via Integrated Dynamic and Static Analysis.- Accurate and Efficient Structural Characteristic Feature Extraction for Clone Detection.- Enhanced Property Specification and Verification in BLAST.- Finding Loop Invariants for Programs over Arrays Using a Theorem Prover. Prof. Dr. Martin Wirsing ist Leiter des Lehrstuhls für Programmierung und Software-Technik des Instituts für Informatik der LMU München und Vizepräsident der LMU für den Bereich Studium.